I am going to start this post by saying that if you have anything against canned soups, you will probably just want to stop now. 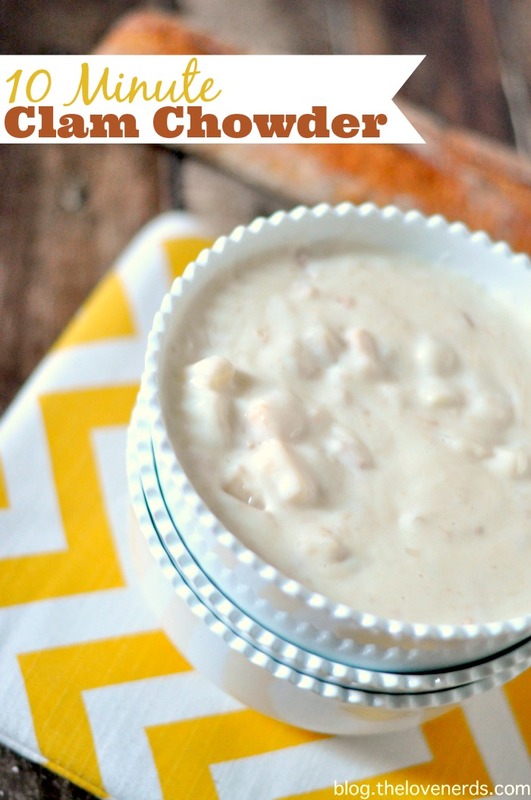 However, if you love super easy recipes, you will LOVE this recipe for a creamy, 10 minute Clam Chowder! This soup has always been a staple in my family. There used to be a restaurant down in St. Louis called Noah’s Ark and they had the BEST clam chowder soup. When the restaurant closed, someone gave my mom this copycat recipe to try. It was perfect, creamy and really easy to make for a busy family. Plus, it was a great no meat meal for her to make during lent. 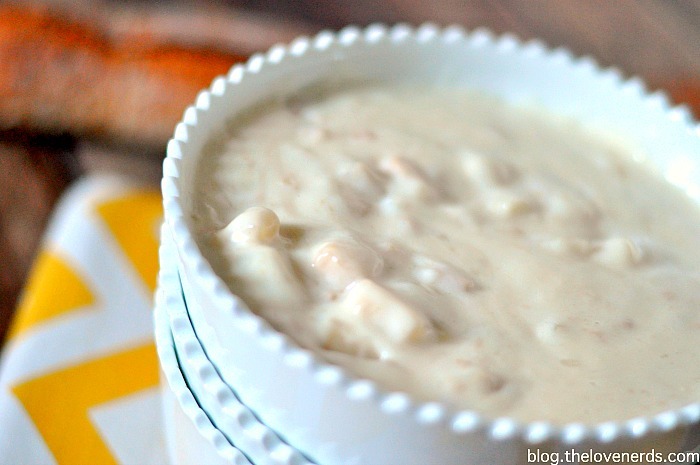 When I introduced Bryan to this soup, it was his first time ever having Clam Chowder. I wasn’t sure if he was going to like it or not – he can be a picky eater sometimes – but he loved it! During the cooler months, it appears once every month or so on the menu and always on a busy night because it really does only take me 10 minutes to make. 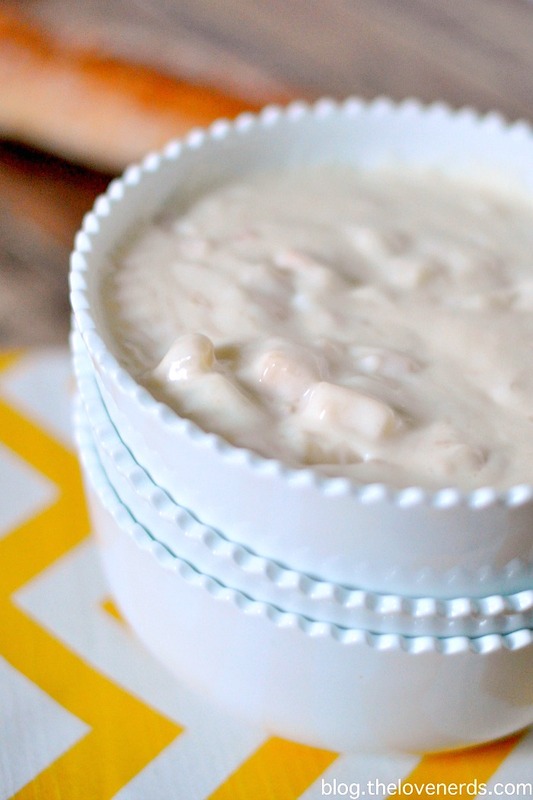 A 10 Minute Clam Chowder that is delicious any night but is especially perfect for busy nights! Combine all the ingredients in a pot and stir together. Heat on high - medium/high, stirring often. Remove when heated all the way through. I usually remove once the soup is at a steady bubble. How much this batch makes depends on how how much your family eats. This batch for us makes enough for my husband and I plus one small lunch. Bryan eats like half the batch, especially if he went running that day. Serving the soup up in a bread bowl would be a great way to stretch the soup even further though and really delicious! Ha! I LOVE the way you started the post! 🙂 I’m working on a Crockpot potato soup right now and it’s pretty much based on canned soups, too. The first thing I thought of was that it’s REALLY not a “real food” kind of meal. But it’s SO GOOD and so easy! 🙂 This sounds great, and I really love clam chowder!